Is the Earth Bigger Than the Sun? I got this strange question by email a few days ago, so I thought I’d tackle it: “Is the Earth Bigger than the Sun?”. Nope, the Sun is much, much bigger than the Earth. From here on Earth, the Sun looks smaller than the Earth, but that’s only because you’re much closer to the Earth than the Sun. You’re standing on the surface of the Earth, while the Sun is 150 million km away. But if you could get far enough away that both the Earth and the Sun are the same distance, you’d see the real size difference. The diameter of the Sun is 1,390,000 km. Just for comparison, the diameter of the Earth is only 12,742 km. This means that you could put 109 Earths side-by-side to match the diameter of the Sun. And if you wanted to try and fill up the Sun with Earths, it would take 1.3 million Earths to match the volume of the Sun. The Sun is the largest, most massive object in the Solar System by far. It accounts for 99.86% of the mass of the Solar System, with most of the remaining mass taken up by Jupiter, which is the largest planet in the Solar System. You might be surprised to know that there are many stars which are much larger than the Sun. The red supergiant star Betelgeuse, in the constellation of Orion, is thought to be 300-500 times larger than the Sun. And the largest known star, VY Canis Majoris, it believed to be 1800-2100 times larger than the Sun; at the very theoretical limit of star sizes. We’ve written many articles about the Sun for Universe Today. 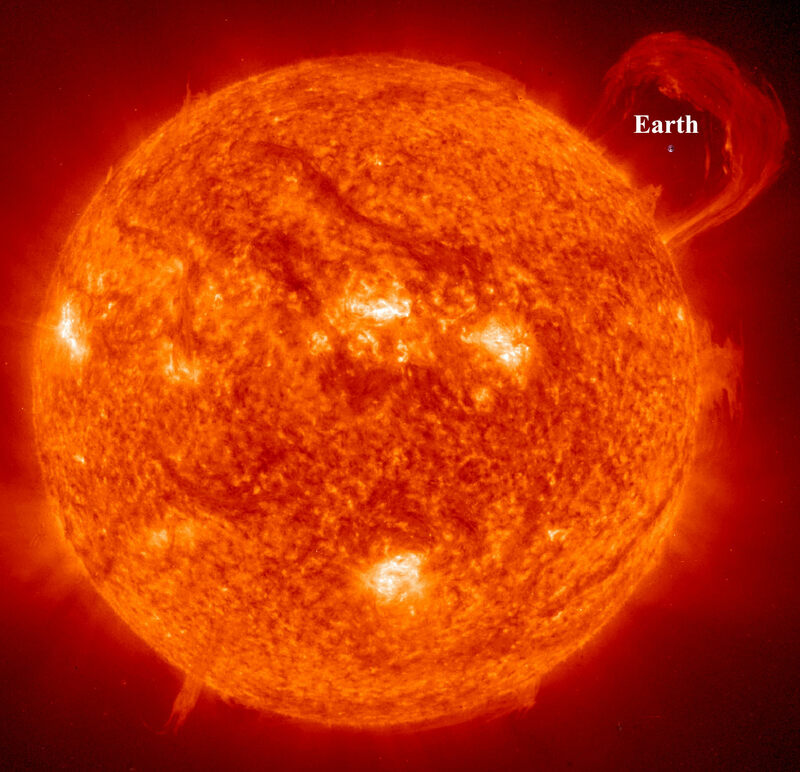 Here’s an article with interesting facts about the Sun, and here’s an article about how big the Sun is. If you’d like more info on the Sun, check out NASA’s Solar System Exploration Guide on the Sun, and here’s a link to the SOHO mission homepage, which has the latest images from the Sun. We’ve also recorded an episode of Astronomy Cast all about the Sun. Listen here, Episode 30: The Sun, Spots and All. Previous PostPrevious Who Discovered Uranus and When? Next PostNext How Are Shield Volcanoes Formed?